While peace parleys convene, only to end in failure and increased hatreds, military inventors smile to themselves and go on perfecting their engines of death. This article sets forth advanced data on these new weapons and tells how they will add deadliness to combat when they appear at the Front in next war. FROM the bow of a submarine lurking submerged in the offing shoots a torpedo bound on a mission of destruction. Leaving a streaked wake as it cleaves the water, it speeds straight for the hull of an unwary destroyer cruising across the horizon. With cool haste the destroyer’s commander signals the helmsman to put the wheel hard a’port. Then while the long, deadly torpedo dashes ahead, the lean, gray destroyer swings sharply to the left, and the commander breathes a sigh of relief, for he believes he has maneuvered around in time to get out of the path of the onrushing missile. But suddenly and unaccountably the torpedo alters its course, too, and makes a bee-line straight for the destroyer’s hull. The ship’s commander is bewildered at these strange antics. Again he signals hard a’port. The vessel swings around again, and again the torpedo, now only a nun-dred yards off, changes its courseâ€” straight toward the war dog’s hull. The commander shouts orders for the third swing to port, but it’s too late. The torpedo dashes against the destroyer’s side and there is an ear-splitting detonation. Like some inescapable undersea Nemesis, the submarine’s missile has hunted down its victim and sent it to the bottom of the sea. Thus may naval encounters of the future result, thanks to the development of a new type of torpedo which will literally chase its victim around the ocean till it finds its mark. Complete details of the amazing torpedo are veiled in secrecy. However, sufficient information has been released by its inventors to give a fairly clear idea as to the operation of its mechanical steering brain. The secret of the steering mechanism lies in the electric eye built into the nose, just beside the detonating cap, as illustrated in an accompanying drawing. Special filters mounted in front of the “eye” screen out all but infra-red rays, that is, the invisible heat rays at the lower end of the light spectrum. When infra-red rays impinge upon the electric eye, a current passes through it which operates a set of relays controlling the steering mechanism of the torpedo, shifting the rudder to direct the missile in the direction from which the infra-red rays emanate. Now most all bodies which radiate heat radiate infra-red rays, heat and infra-red rays being practically the same thing. A naval vessel radiates a slight degree of heat from its engines and it is these infra-red rays which attract the torpedo to the vessel’s hull, much as a magnet attracts a piece of steel. No matter what maneuvers the ship may go through, the torpedo, speeding towards the source of the infra-red rays, will always strike its target. One of a number of new instruments of war, the invention of this new engine of death points out a distinct trend in the development of weapons for future wars. There is much wild talk among laymen in military matters about weapons so hideous that in battles in the next war whole regiments will be annihilated in the batting of an eye. 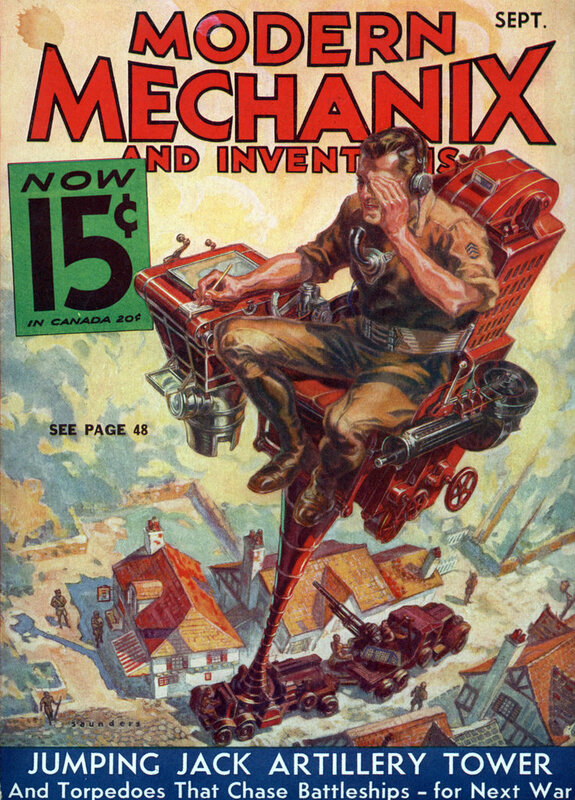 Thorough research on the part of Modern Mechanix and Inventions correspondents, however, indicates that military inventors are devoting their energies more to perfecting weapons which have already proven their practicability and deadliness in the clash of battle, rather than to fantastic schemes for wholesale destruction of enemy forces. The World War was responsible for many hastily contrived weapons, but it also pointed out the weaknesses of these weapons. Inventors are profiting by the lessons the war taught. One lesson had to do with the vulnerability of the captive observation balloon. Floating like gigantic sausages in the air, they were fair game for any enemy plane that chose to attack. A stream of incandescent bullets sent them flaming to earth in a cloud of smoke. Inventors have now relegated these massive bags of inflammable gas to the limbo occupied by the catapult and the battering ram. Their positions behind the lines in the next war will be occupied by the jumping-jack observation tower shown in an accompanying drawing. From the vantage point of his perch atop the telescoping tower, the observer will scan the battlefield to report enemy movements and effects of artillery fire, while a ground crew holds itself in readiness to lower the mast the moment an enemy plane shows itself in the skies. There will be much less danger of an attack, however, because the tower, tall and slender, will not bulk so huge against the sky as the old-fashioned observation balloon used in the World War. Other large advantages are represented in the extreme mobility of the tower, since it can be lowered and raised in a few minutes, and transported to some vital battle area as fast as an auto can move. 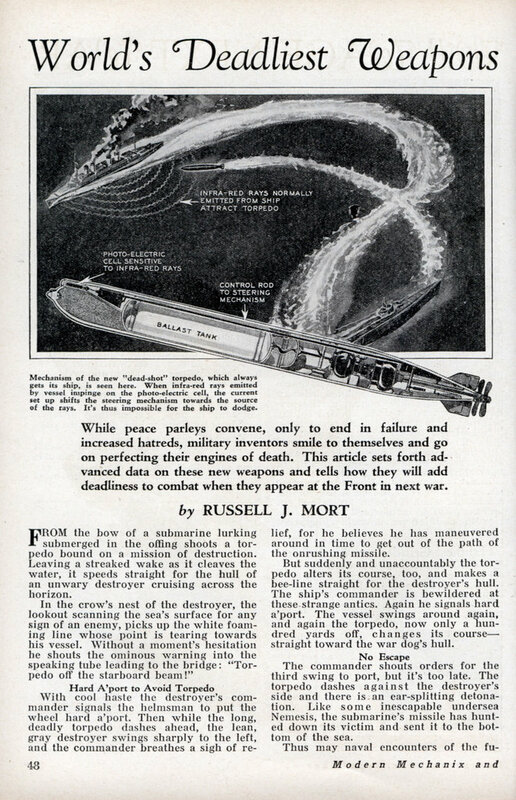 A weapon to combat the formidable tank was another problem that confronted military men during the World War, and it was not until very recently that a satisfactory solution was found. This solution is a high-velocity bullet which drives right through the toughest tank armorâ€”a solution, too, which bears out the military commonplace that for every weapon of offense there is a weapon of defense. An invention of H. Gerlich, a German ballistics expert, the bullet is now under investigation by small-arms technicians of the American Army. The secret of the extraordinary armor-piercing power of the new bullet lies in its “compressibility.” The projectile goes in at the breech at .35 caliber and comes out the nozzle .25 caliber. This compression is effected by tapering the bore as illustrated in an accompanying drawing. The projectile is equipped with two flanges, .35 caliber in diameter which slip into the ammunition chamber of the rifle, whose bore is channeled to fold down the flanges as the bullet speeds towards the muzzle. Decided advantages are represented in this arrangement. The large cross-sectional area of the bullet before firing offers a maximum surface to take the full force of the explosion of the powder, while small cross-sectional area of the “compressed” bullet emerging from the muzzle of the gun reduces wind resistance, and hence loss of velocity, to a minimum. It is this combination of features which accounts for the bullet’s terrific velocity of 5,000 feet a second, nearly double that of standard army rifles, and gives it distinct advantages. The line of flight, or trajectory, is flattened to a minimum so that soldiers need not trouble about adjusting their sights when firing at distant objects. Also the time of flight from rifle to target is greatly shortened, a highly important feature for anti-aircraft machine gunners firing at a fast-moving target. Above all, however, whizzing at extreme velocity, the bullet drives straight through the hardest tank armor. At such speed, the inventor claims, the projectile has no time to flatten out on striking a hard object; it goes through the steel like a straw goes through a board in a tornado. Military authorities see many tactical advantages in this new Gerlich bullet and its adoption as a standard instrument of war is expected. The next development to be looked for is an anti-anti-tank bullet armor, and following this, an ultra-high velocity bullet. The next war will also see another new convenience in the art of machine gunningâ€”a phosphorescent bullet which shows the gunner what he’s hitting when he fires into the darkness of the night. Heretofore night shooting has been nothing more than pot-shooting. Except when a parachute flare illuminated the battlefield, the gunners were firing blindly into blackness. Developed recently by the English Chemical Warfare service, the bullet has a phosphorous nose that creates wherever it strikes a luminous splotch, enabling the gunner to get the range of his target, and eliminating all guesswork. Did anyone think IR passed through water? That this process might be better suited for antiaircraft rockets? And….Radium? Isn’t that stuff $1 million an ounce? what a nice development by you people in fact am in support of whatever you are doing.Lets see how the terrorists will again disturb the world but make sure that you don’t release your technology any how for it is exactly what the terrorists use to threaten you and the entire world.